We’d love your help. Let us know what’s wrong with this preview of A Difficult Act to Follow by Henry James Korn. "Henry Jam A masterful collection of contemporary myths in which Jack Spratt, Howard Hughes, King Kong, Groucho Marx, Charles Dickens, Sparky Anderson, Norman Mailer, George Steinbrenner, Fidel Castro and Edward Kennedy appear and reappear in fact and fiction in a panoply of cultural history by the author of Muhammad Ali Retrospective and Amerikan Krazy. "Henry James Korn's sensibility is leavened by ingenuous appreciation for pop products enabling him to walk a wire teetering between naïveté and didacticism without losing his balance, a feat that makes Henry James Korn a true humorist rather than just another cynic. While moral and political concerns are strongly evident, the author seldom permits them to dominate the scene. His world is fully objectified. Images of extraordinary clarity infuse his lyrical, comical and satirical visions with authentic power. Henry can take a dozen words and fill you with sweet sorrow for all humankind." "Henry James Korn writes elegantly. I particularly liked his baseball writing in A Difficult Act to Follow that seemed deeply felt and special." 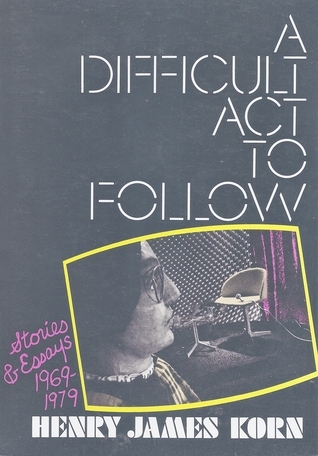 To ask other readers questions about A Difficult Act to Follow, please sign up. Henry James Korn's debut novel Amerikan Krazy is coming on February 22, 2016. Korn has written about art, sports, popular culture, media and history for magazines and newspapers and his stories have been published in fiction anthologies and literary magazines. Korn was awarded a writing fellowship from the National Endowment for the Arts. From 2008-13, Korn served as Orange County Great Park princip Henry James Korn's debut novel Amerikan Krazy is coming on February 22, 2016. From 2008-13, Korn served as Orange County Great Park principal planning and program development specialist for arts, culture and history where he organized festivals and exhibitions and guided planning for the Palm Court Arts Complex and Great Park Gallery. Korn previously served as Director of the Poway Center for the Performing Arts Foundation; Director of Arts and Culture, City of Beverly Hills; President of Guild Hall of East Hampton (Eastern Long Island's cultural center); Cultural Affairs Manager for the City of Irvine, Arts Commission Director for the City of Santa Monica; Executive Director, Lower Manhattan Cultural Council and Administrator of New York's Jewish Museum.